The Aquarium du Québec is a fun-filled attraction for travelers of all ages. The aquarium provides an entertaining and informative perspective of sea-life. Covering the aquatic world from the Boreal Zone to the Arctic, the aquarium is stocked with reptiles, amphibians, invertebrates, and a wide variety of fish. 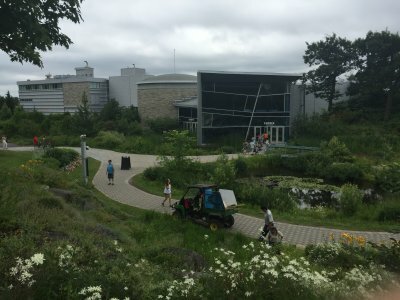 The aquarium also features a unique permanent exhibit on the marine mammals prominent in the Saint Lawrence River and other Canadian bodies of water. Highlights, such as a 16-hectare outdoor park featuring polar bears, walruses, and seals, are some of the unique experiences you will encounter. Growing in size each year since its opening in 1971, the aquarium houses more than 10,000 animals, encompassing 300 different species of fish, amphibians, invertebrates, reptiles, and mammals. Their mission is simple: devotion to environmental protection and community education in aquatic ecology. They have uniquely accomplished this throughout the years and have become an extraordinary centerpiece to the city. The Aquarium also so so much more than just sea life. The grounds are so beautifully maintained you would think you are visiting a botanic garden! Part of the landscape includes a small waterfall, a variety of flowers and my favorite- an area with “lily pads” for you to walk or hop through a small pond area. The Aquarium also has a small sprinkler park and playground to keep the kids happy. We recently visited and there are so many attractions to take in when you are there. We enjoyed both the seal and walrus live shows. They were very entertaining even though they were mostly in French. My daughter enjoyed the Coastal Zone Discovery, where she touched a plethora of invertebrates and learned about these special creatures from a naturalist. My daughter’s favorite activity was the Arbre-en-Arbre Adventure Circuit. Here kids 6-12 years of age can participate in their own adventure a safe 70cm off the ground. A montage of foot bridges, nets, monkey bridges, tunnels, and vines of every shape and size are in the theme of a seafaring pirate adventure. I enjoyed sitting in the shade and watching. There are many places to grab a bite to eat. We enjoyed lunch at La Grande Ourse which is the main restaurant at the Aquarium. With spectacular views of the Saint Lawrence River and Québec’s bridges, it’s not surprising the restaurant’s terrace is heavily requested during the summer months. In a cafeteria-like setting, the restaurant offers home-style cooking, pastas, desserts, salads, and daily specials. Simply in need of some cooling off? Just outside of La Grande Ourse restaurant is La Voie Lactée Dairy Bar. Try a scrumptious ice cream or other frozen treat in the summer! There are also many picnic tables scattered around the Aquarium where you can enjoy your own packed lunch. 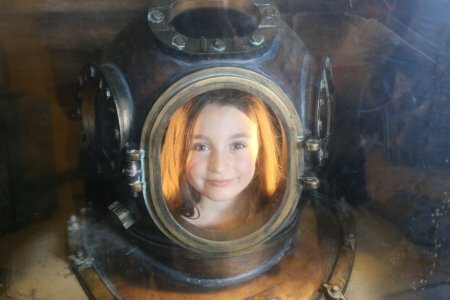 My family thoroughly enjoyed the Aquarium and we found it a great day trip from Old Quebec.